Please join us for our VPK Parent Meeting on July 31. Registration is initially confirmed by completing a preregistration form and presenting your signed VPK certificate. Some additional paperwork is required prior to the start of classes. VPK runs from 9 am – noon each weekday with a school calendar that primarily mimics the public school calendar. Wraparound care is available during our normal operating hours. 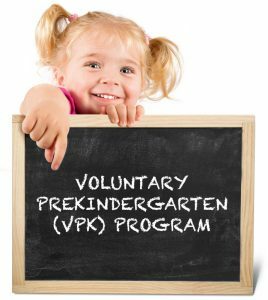 To apply for VPK online, please click here.